KitchenAid ovens with a self-cleaning feature have a locking mechanism that activates when the oven reaches a certain temperature during the self-cleaning cycle. 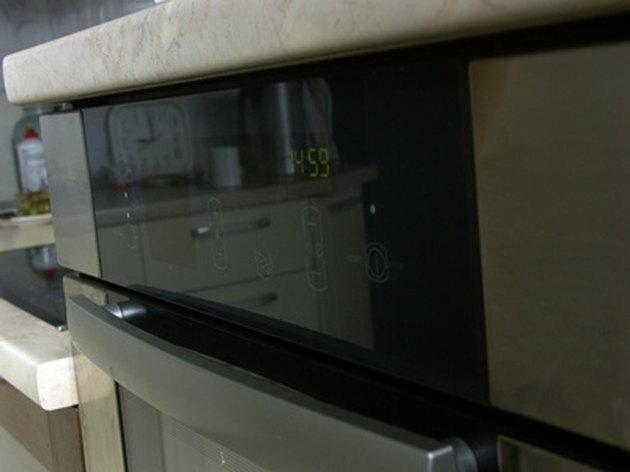 If power to the oven fails during this operation, the oven will remain in the locked position and disengaging the lock can be quite difficult. A little background information on how the self-locking mechanisms operate in various models of KitchenAid ovens should enable the homeowner to troubleshoot the problem and unlock the oven. KitchenAid ovens with no power might become locked. Check the circuit breaker to see whether it has been tripped. A defective heating element or a loose connection in the oven could trip the circuit breaker. Flip the circuit back on and cancel the self-cleaning cycle on the oven by touching the "Self Clean" button if this is what caused the oven to lock. Let the oven cool and the lock mechanism should disengage on its own. If not, proceed to Step 2. Determine what kind of mechanism controls the lock on your particular oven model. A solenoid-controlled lock makes a loud buzz or clunking sound when the lock activates. A heat-sensitive lock makes no sound at all, and a motorized lock makes a distinctive ratcheting sound. Check the owner's manual if you are unsure of the lock mechanism on your particular model. If the oven lock is the heat-sensitive type or motorized, call a service technician. Otherwise, go to Step 3. Unplug the oven as a safety precaution. Reaching a solenoid-controlled lock requires taking apart a small portion of the oven. The solenoid will be located in one of two places. Remove the rear panel located at the back of the range by unscrewing four screws. Down in the exposed cavity at the rear of the stove, locate the solenoid coil, a small round assembly with a piston latch that pops out to lock the oven. Unplug the solenoid and replace it. If the solenoid is not located in this area, go to Step 5. Remove the electric burners from the top of the range. Then unscrew two or four screws at the front of the range, and slide off all the burner control knobs. Remove the front panel and lift the top of the range off the oven. Locate the solenoid at the front of the stove above the oven door. Unplug the solenoid and replace it.